Our new app for professional installers serves to define the concepts of user and PRO. Now each has their own separate tool for managing a security system with a different set of functions. For now, the applications are similar in many respects, but we will continue to develop them, adding unique features. This happened thanks to the ideas that we regularly receive from Ajax users and the security companies they trust to monitor their systems. With the new app, both a user and a professional installer can simultaneously serve as hub administrator. Users are system owners who have connected the hub to a central monitoring station or use it for self-monitoring. Previously a user needed to give up their full administrator rights to the security company, but now they can be an administrator with the same access rights as a PRO. Users are divided into three types — administrators with full administrator rights, administrators with limited rights and regular users. Full administrators can fully control and configure the system. Limited administrators can control the system arming mode, change notification varieties and invite other users, but they do not have access to the system settings. Regular uses can only arm/disarm the system, use the alarm button, monitor video and receive alarm notifications. Administrators with full access can also, by request, access the PRO settings or revoke permissions. A PRO is a professional installer or security company worker. 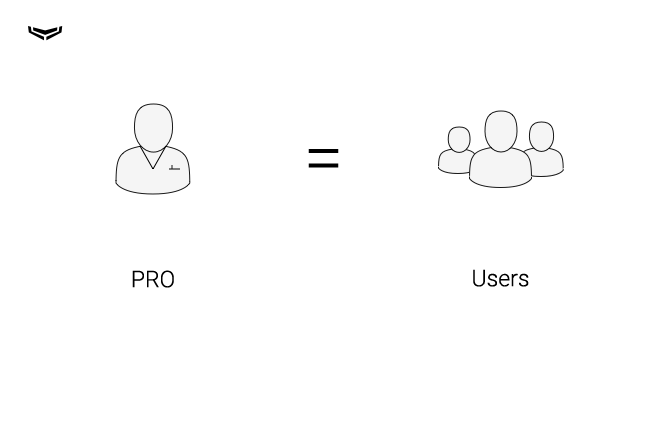 There are two types of PRO users: full PRO users and limited PRO users— the latter aren’t given access to hub settings. Only hub owners with full administrator rights and full PRO users can give access to settings and additional PRO functions. The hub owner can give fully unlimited access or temporary access to the system settings for one, two, four or eight hours. When that time elapses, the additional rights will automatically be revoked. With the release of the Malevich hub operating system, the number of users that can be assigned to a single hub was increased to 50 people. This number affects all users— PRO, administrators and regular users. You must create an account for PRO. To do so, go to the main screen of the application and enter your name, phone number, email address and create a password. You can use the same email address in both apps, but the registration process must be completed again. Note: this only affects professional installers and security company workers. Since system owners have a separate mobile application for users, there’s no need for them to register with Ajax PRO. For new clients, a PRO can provide their email and a user can add that installer to their hub. Professional installers have full access to all hub settings for 8 hours. After this time, access will be restricted and can only be restored after a second request. Existing clients that are already connected to a central monitoring station must be moved to the new application. To do this, assign a PRO account to the hub in the user application. You’ll need to send an invitation to the email you used to register your PRO account. After that, you will see the hub and detectors in the PRO app, as well as be able to configure user access levels. After transferring the existing clients’ hubs to the Ajax PRO application, you will not need to reconfigure the system, as all parameters will have been saved. Engineers, professional installers and security companies have now received the mobile application features they’ve been asking about. And, in time, there will be even more useful app functions. Speed. Professional installers no longer need to stare at their smartphone screens for 40 minutes, waiting for updated information on hundreds of client hubs. The new application only updates configuration information when you’re looking at the settings of a particular hub, not for all devices at once (which was the case before). Simplicity. Remote configuration will simplify maintenance, as you will be able to make changes while on your way to a monitored object. And once you’re there, you’ll only need to ensure that the system owner is satisfied with everything. Practicality. Now, users and installers have two separate applications. And changing configuration settings depends on a particular user’s access rights.